I have a new favorite green bean recipe now that is bursting with garlic and sesame flavor. I saw a recipe in a Cook's Illustrated magazine which was more involved than I wanted, so I just reduced and eliminated some of the ingredients and just used garlic and sesame for these yummy beans. The garlic is definitely assertive, but it does not over power the sesame seeds. The sesame flavor is very evident, which caused my husband to proclaim these beans as "awesome"! Make your taste buds happy and give these a try! Heat oven to 450 degrees and line a baking sheet with aluminum foil. Spread beans on foil; drizzle the olive oil over the beans and toss well to distribute the oil. Sprinkle with coarse salt. Roast beans for 10 minutes. Toast the sesame seeds in a pan for about 30 seconds until fragrant and slightly golden. Mix the sesame oil, red pepper flakes and garlic together. After the beans have roasted for 10 minutes in the oven, remove the pan from the oven. Using tongs, coat the beans with the sesame oil, garlic and red pepper mixture. Spread the beans out and place back in the oven for another 8-12 minutes. Green beans will appear shriveled and have golden brown spots when done. Remove from oven; adjust seasoning and toss with the toasted sesame seeds and serve. Enjoy! This sounds really good! Love all that sesame flavor and will be trying it. Thanks for the recipe! Wow, I love the sound of this recipe. 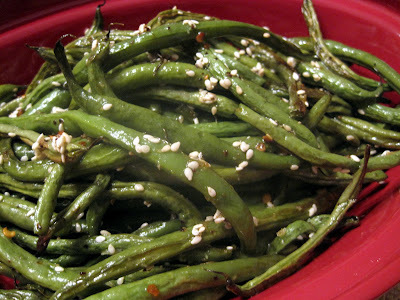 Green beans are a favorite here and the garlic and sesame would really dress them up without a lot of fuss. soooo yum. I make my greenbeans like this as well..but I add some soy sauce in there too. My kids LOVE them! A very delicious and healthy stir-fry! This is a wonderful side dish idea for thanksgiving dinner! Delicious flavors. I must say - you've never steered me wrong with a recipe.I love the aroma toasted sesame seeds and these beans are scrumptious. Oh, I definitely love all of the flavors in here...sounds perfect! Great veggie, Lynda. I love the simplicity and can just imagine how great they taste! I like the sound of these. I think I saw the same original recipe in Cooks and I like the slimmed down version you came up with. Mmm...sounds look a wonderful way to fix up some green beans.